So nothing extra to buy! You’re complete and ready to cook any meal. This unit has 12 litre capacity or 17 Litre if using the extender ring. When we ordered our sample for testing ( which arrived in record time and 2 fewer days than Amazon stated) The unit was overall very impressive, compared to some of the other makes, quite well made. There were no omissions, breakages or faults, the unit worked well and quietly first time and every time. The timer functioned accurately and the example cook book had reasonably correct timings in it ( though not the most interesting or thorough of cook books ) . The instruction book is probably the worst part and not worth even opening summise to say it simply states the obvious…. I think I can find the on/off button without help! One of the best improvements in the design I think is the position of the lamp, in some other cookers it is too low and prone to get splashed and stained during cooking, this will shorten the life of the unit and cleaning isn’t a practical idea, in this one it is better placed and so remains clean . I tried fish fingers, burgers, bacon, fish cakes, chicken breasts, baked potatoes, cheese on toast and home made chips done in the machine in a drizzle of olive oil. All turned out extremely well and got good marks from the tasters ( the family ) . I thoroughly recommend ordering through Amazon, their customer service and delivery is second to none. 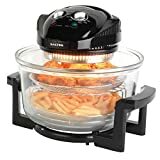 This Halogen Cooker is great value, the 2 year Guarantee and free spare lamp were a big factor in our conclusion that this is the best Halogen Cooker currently available. The power consumption is stated at 1300Watt. Update May 2013: Its quite some time since I got the Andrew James Halogen Cooker and wrote this article I still use it everyday and it is still working perfectly. I have noticed, when reviewing the different makes and models, especially the newer models, the fan noise from them can be excessive compared to this model. Although some units are lighter, I wouldn’t change my favourite, well made, durable, it is a superb work horse.